One who is not interested in Engineering & Medical field, Law is the next most popular course the student’s of India will opt. As all of us know that “Law” is the basic part of our Constitution. Law is nothing but the system of rules that are enforced through social institutions to govern behavior. If your goal is to get admission in a Law School, then it is better to shortlist the dream colleges and appear the Law Entrance Exam. Law is the best career option for the present generation. A degree holder in law has wide opportunities in various fields. Students who hold a degree in Law are recognized as “Lawyer” and have to do the court activities and practice before the entry in the court. 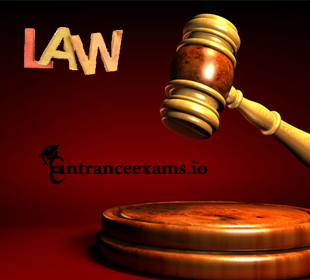 We will be listing here the popular Law Entrance Exams in India for the reference purpose of the candidates who want to make their career in the field of Law. After the completion of the 12th standard examination, one can either pursue BA LLB, BBA LLB, B.Sc LLB or 3 year LLB after the completion of graduation in any stream. In India, various National & State Level Law Entrance Exams are organized every year for the admissions into undergraduate and postgraduate courses. Law Entrance Exams are also conducted in University Level to provide the admissions into various law courses. In order to get the admission in any one of the top most law colleges, aspirants have to appear for Law Entrance Exam. Candidates who aspire to start the career in law field can check the details of Law Entrance Exams. Candidates can apply for more than one exam on the basis of their choice of course and college. We have provided here the list of National Level Law Entrance Exams through the below sections. This is a National Level Law Entrance exam organized for admission in UG, PG and Integrated law courses offered by 18 National Law Universities in India. It is commenced once in a year in the month of May and the online registration will be started from the month of January 2018. This examination is held biannually and tests advocates on the substantive and procedural law. Through this test, BCI judge the capability of LAWYER to practice in the profession of law in India. After passing this entrance test, the qualifying candidates will be entitled to a Certificate of Practice law throughout India. It is a University Level Law Entrance Exam conducted for admission in several programme like B.Sc (Hons. ), B.Com (Hons. ), BA (Hons. ), B.Tech, B.Arch, MBA, MBA (IB), PG Diploma in Islamic Banking & Finance, B.Ed, BA LLB, Diploma in Engineering, Senior Secondary School Certificate (Science Stream), Senior Secondary School Certificate (Humanities & Commerce Streams). Cochin University of Science and Technology is one of the most popular Universities in India. The courses offered by the CUniversityrsity in the stream of law are LLB, BBA LLB, B.Com LLB & LLM. The officials held the CUSAT Entrance Exam every annual in the month of April 2018. Symbiosis Entrance Test managed by the Symbiosis International University for admission to UG courses of the Symbiosis university and its constituents Institutions. The participating institutes are Symbiosis Law School, Pune, Noida & Hyderabad and the courses offered are BA LLB & BBA LLB. Every Annual, the Lovely Professional University organizes the entrance exam for various courses in several fields like Engineering, Law, and others. LPU NEST is the gate way for the candidates who are seeking admission in LLB, BA LLB (Hons. ), B.Com LLB (Hons.) & BBA LLB (Hons.). A list of State Level Law Entrance Exams which provides the admissions into undergraduate and postgraduate law courses are attached here. AP Law Common Entrance Test is a State Level Law Entrance Exam for admission into LLB, LLB (Hons. ), BBA LLB/BA LLB/B.Com LLB/ BA LLB (Hons.) For 3 Year LLB courses, around 8030 seats are available and for 5 Year Integrated LLB courses, around 3800 seats are available across the state of Andhra Pradesh. It is a yearly examination taken by a large number of people in order to get admission for undergraduate law courses across the state of Telangana. Every Annual the Kakatiya University, Warangal on behalf of TSCHE regulates the test for admission into 3Year / 5Year LL.B Regular Courses in Telangana state. Telangana State Post Graduate Law Common Entrance Test which is abbreviated as TS PGLCET. It is conducted by Kakatiya University on behalf of TSCHE for admission to LLM programme in various law Universities/ Colleges of the Telangana state. The Aspiring candidates can appear the test in the month of March 2018. KEAM is very popular & well-known exam for the candidates of Kerala who are seeking for admissions in engineering, agriculture & Law courses offered by the universities & colleges of Kerala. Through this exam, people can get admissions for various undergraduate LAW Courses such as LLB, LLM. MH CET LAW is a State Level Law Entrance Exam conducted for those students looking for admissions in LL.B (Three Year) and LL.B (Integrated-Five Year) programmes. It is a gateway for the candidates who wish to do three-year and five-year integrated law programmes offered in different law schools across the state of Maharashtra. Here, we hope readers might have got all the information on LAW Entrance Exam for which they visited our web portal www.entranceexams.io. Keep visiting this page regularly if you want more updates regarding Upcoming Entrance Exams for Law.